A lot of people only think about the coats, flannels, hats, and gloves required to stay warm in the freezing cold weather. But, if you use the best base layer for cold weather hunting, you can make sure you stay warm and comfortable. We researched a wide range of bottom layer pieces to help you find the best tops, pants, and sets out there. Before we get started, let’s take a quick look at the features you should keep in mind. Type: Whether you want something to wear under your pants or a shirt with thumbholes to keep the cold air from sneaking up your sleeves, we found some great tops and bottoms. That includes sets of both, too. Gender: There are a lot of great choices on this list for men and women as well as some unisex options. 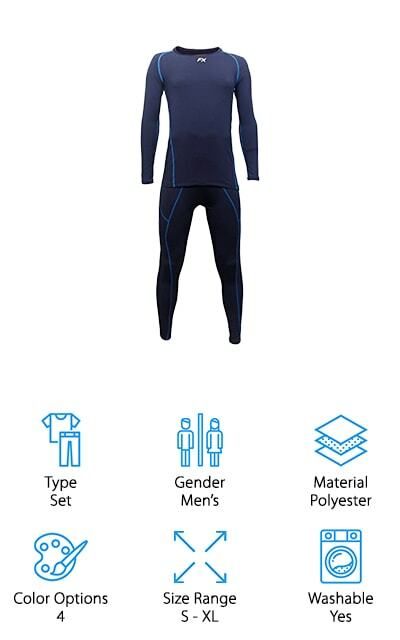 Men’s base layers tend to be a little longer than women’s, but they all offer effective protection from extreme weather. Material: There are quite a few choices when it comes to material. Merino wool is one of the most popular because it’s so soft and natural, but there are plenty of cotton and poly blends on our top ten list, too. Color Options: Color options vary a lot from piece to piece. Most of these products come in standard colors like black, gray, and white. You can find bright colors, too, if you want added visibility or style. Size Range: There really is something here for everyone. Some of these products are available in extra-small and we found some that go all the way up to 4XL. Now, everyone can be safe and warm outdoors even in cold temperatures. Machine Washable: A lot of these products are machine washable but a lot of the manufacturer’s recommended hand washing. Hand washing is gentler and will better maintain the integrity of the fabric so it will last longer. Now that you know a little more about what to look for, let’s get into our base layer reviews. Here’s how it works: we put our top and budget pick right at the top of the list. If you’re in a hurry, that’s the best place to start because it gives you a good idea of the range that’s available. Stick around if you can, we included a lot of variety in this list that you just have to see. Ok, let’s get to it. 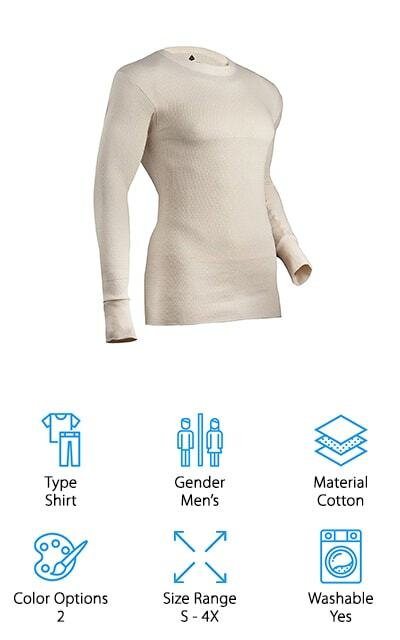 Our top pick is a merino wool hunting base layer from Merino 365. Whether you’re hunting, fishing, skiing, or climbing, this shirt is a great base layer. The fine knit is extremely soft, comfortable, and doesn’t itch. Plus, it’s breathable and helps regulate your temperature so you can enjoy your favorite outdoor activity even in cold temperatures. If you want to be environmentally friendly, this is the perfect choice: it’s sustainable, ethically produced, and made from 100% New Zealand merino wool. This is a unisex shirt is available in a medium through XL and even comes in tall if you need more length. Thumb holes in the sleeves help keep it in place under your other layers and keep cold air from sneaking up by your wrists. It’s even available in 6 different colors. 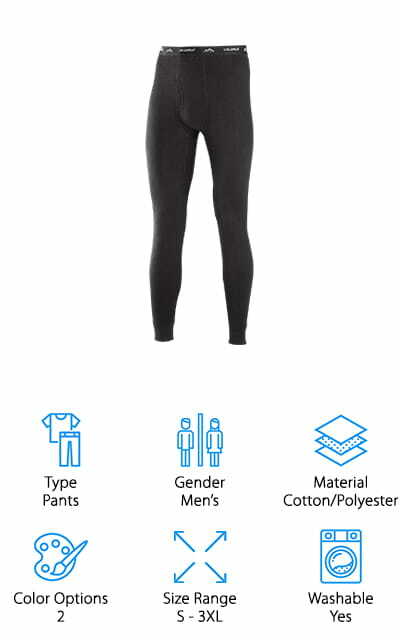 A warm base layer for hunting that’s versatile and budget-friendly are these compression pants from Tesla. They have the right amount of elasticity to stay snug while also having an effective range of motion. With 3D patterns a thoroughly researched design, these pants were based on how body heat actually dissipates and how to best maintain thermal insulation. The fabrics used are extremely lightweight. They’re moisture wicking and draw sweat away from your skin through to the next layer and the deodorizing properties prevent any bad smells. That’s not all, these pants are also lined with a thin, microfleece layer that provides added warmth and softness. And here’s the kicker. To make sure it has a close fit, it’s body-mapped for a snug fit. This also provides compression which can help improve overall performance. 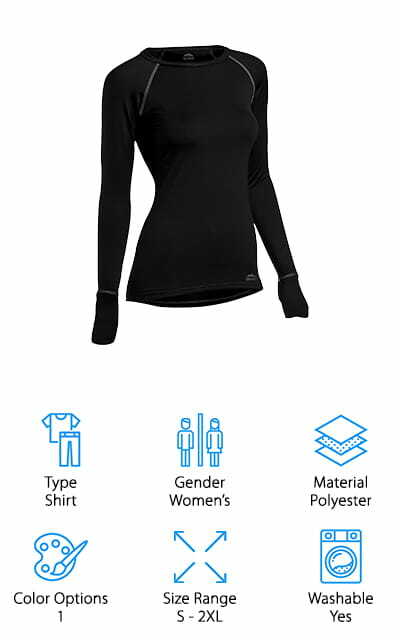 A great base layer shirt for women is the Duofold Wicking Shirt. The double layered cotton/poly blend not only insulates, it also wicks moisture away to keep you dry and comfortable. The result is a lot of warmth without a lot of weight. Because it’s a blend of cotton and polyester, you get the best of both worlds: the softness of cotton with the performance and durability of polyester. It fits snugly and has just the right amount of stretchiness to layer without feeling bulky. The pointelle fabric has just the right amount of detail to give this shirt a feminine feel. Plus, the flat lock seams and no-tag design help avoid any skin irritation. This shirt is machine washable, an important feature for a shirt that’s going to be worn for outdoor adventures. A good base layer for hunting is the ColdPruf Dual Layer Bottom. What makes them so special? The ring spun cotton and polyester blend has been engineered to trap air between the double layers of fabric. These pants have been designed to wear in very cold weather for low to medium level physical activities, perfect for hunting, fishing, or camping in the fall and winter. These pants are great for layering because they fit so well. They’re snug without being tight and the ring spun yarn used in the fabric is really soft and comfortable. The seams are flat and there’s no tag to rub against your skin, either. One more thing, they’re available in a really wide range of sizes. They come in small all the way up to 3XL and even have tall sizes available. If you’re looking for a base layer to wear with the best hunting rain gear, Fitextreme’s Maxheat Thermal Underwear is a good choice. 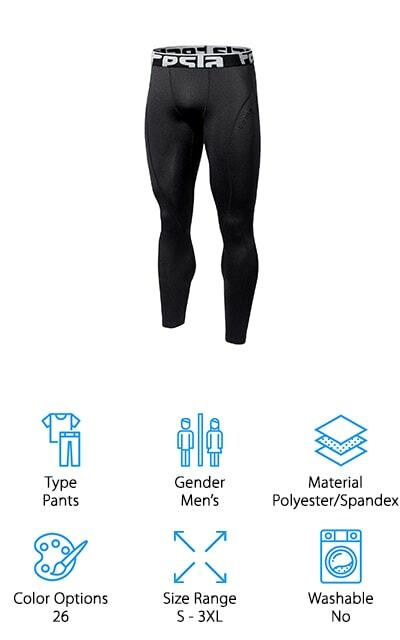 This is a top and bottom compression long underwear set that’s also available in separates just in case you only need a top or bottom. These pieces have an amazing fit thanks to the four-way stretch compression. They’re tight enough for easy layering and to provide some slimming but not so tight that they restrict movement. Not only do they provide great heat retention, they also wick away moisture and sweat to keep you comfortable at all times. The stitching doesn’t rub so there’s no skin stimulation, either. They’re lined with premium soft fleece, too, which provides additional warmth and softness. They’re available in 4 different colors from small to extra-large. 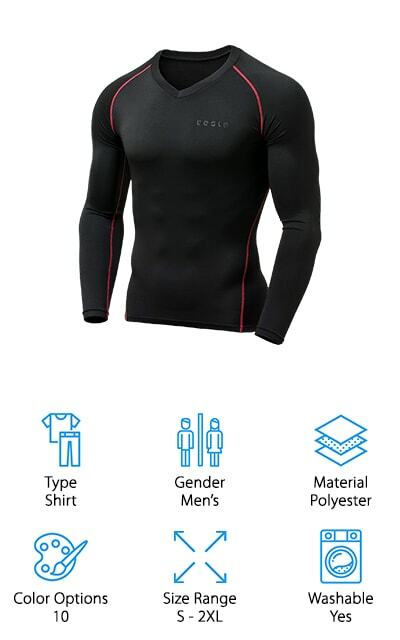 Tesla Base Layer Compression Top is next up for best base layer for hunting. These shirts are made to fit really snug so it’s a good idea to order one size up from what you usually wear. Don’t worry - it will still fit close enough to layer! The polyester/spandex blend provides outstanding elasticity and range of motion and the warm fleece lining keeps you warm on all your outdoor adventures. The fabric is also great because it has two way air circulation, wicks moisture, and has a quick dry time. A lot of research went into the design to figure out body heat dissipates and how to best maintain a high level of insulation. This fabric won’t chafe your skin and even has UPF 50 to keep harmful ultraviolet rays from your skin. The Indera Military Issue Top might look like basic hunting apparel, but this 100% cotton shirt brings a lot to the table. The heavy Raschel knit traps and retains body heat and was designed for very cold weather and moderate activity. This is a great base layer for hunting, fishing, hiking, or camping. It’s machine washable and shrinkage controlled and there’s no tag, which means no uncomfortable rubbing. The sleeves have long cuffs that stay snug and keep cold air from sneaking in. One of the best things about this shirt is that it’s available in a wide range of sizes, all the way up to 4X. Even though this is a men’s shirt, it’s a good pick for women, too. The traditional long john style is a classic and is great for just about anyone. 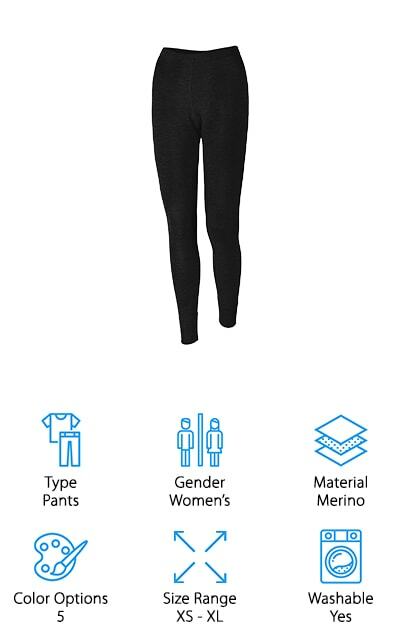 If you’re looking for a great wool base layer for women, these Meriwool pants are tough to beat. They’re made of 100% superfine merino wool that’s exceptionally comfortable and never itchy. One of the best things about these leggings is that they provide a lot of warmth without adding a lot of weight. They’re easy to move around in and naturally breathable. 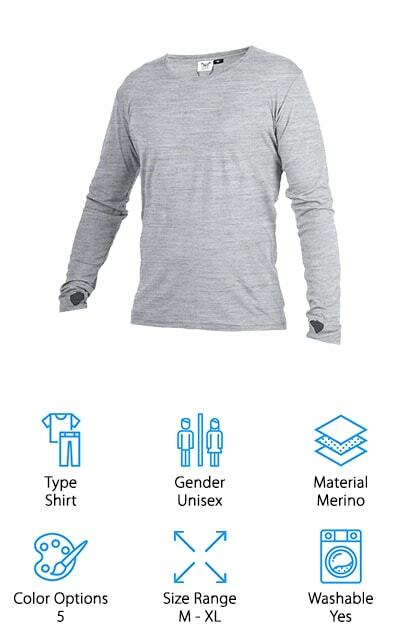 Merino wool also has natural moisture wicking, anti-bacterial, and odor resistant qualities that make it a great choice for outdoor activities. While hand washing is best to maintain the quality of the material, these are machine washable, too. Just use cold water and put it in the dryer on low heat or lay flat to dry. These leggings are available in extra-small through extra-large and 5 different colors. Plus, they come with a 1-year manufacturer’s warranty. Next up in our base layer buying guide is the Climacool UPF Top from adidas. This is a great choice if you need an extra layer of protection when it’s still important to maintain breathability. The climacool base layer is an all over mesh fabric that’s insanely breathable. Plus, it offers UPF 25 protection against the sun’s harmful rays. This shirt is a great pick for hunting as well as athletic activities like running and hiking. Its tapered fit allows you to move freely and the tagless construction and smooth stitching add even more smoothness and comfort. The moisture management will help wick away sweat and dries quickly. It’s available in sizes small through extra-large and comes in 4 different colors, including black, gray, white, and high visibility red. 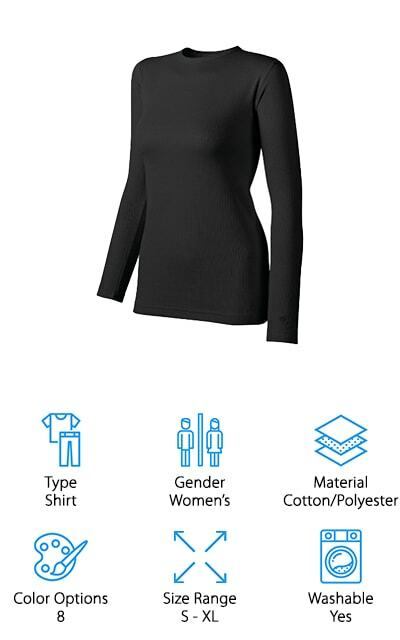 Last up is one of the best base layer shirts for women around. 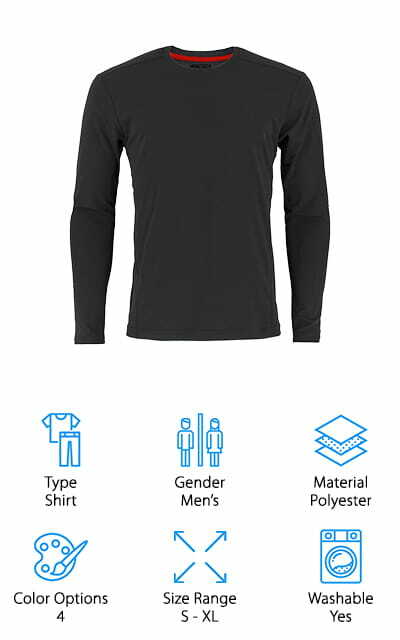 ColdPruf Quest Base Layer top is made of a blend of polyester and spandex and has some integrated silvadur. This is a single layer shirt that offers odor control and helps wick away moisture and dries quickly. It also helps control the bacteria that causes odor in the first place. A lot of people think about staying dry outdoors and only consider the weather and if it’s going to rain or snow. Controlling sweat is important to staying dry, too. If you’re looking for something to wear during extreme activity in the coldest weather, this is the one. The drop tail and thumbhole cuffs provide extra coverage so the cold can’t sneak under your shirt or up your sleeves.